The June Challenge for the Book of Me Scrapbook Layouts will focus on when we were young, what we were like, who we grew up with, and where we lived. Since school is out in June, this is a great time to focus on you as a child and compare to your own children, get our your old school photos. Both of these layouts were early professional photos. One was a 5 x 7 and the other and 8 x 10. I hand cut the ovals from the background paper with the Fiskars Decorative craft scissors. That made any imperfections in the cutting not show. Scrapbook Layout Ideas: Using the large heritage portraits doesn't leave much room for embellishments, but sometimes they can just be simple to allow the photos to speak for themselves, like these with just a simple frame. Small paper flowers could also be added to the "frame" around the photo. Ultimately, I plan to put that locket in the left photo on the page in a small plastic container or preferable a shadow box to showcase it and protect the locket. 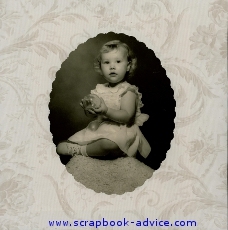 Option #1 - YOU AS A CHILD - For this scrapbook layout idea, focus on you as a young child. Were there interesting circumstances surrounding your birth? Or a particular event during your childhood that significantly influenced your life? What was your personality like? Did it get you in trouble or keep you far from it? What are your earliest memories? Your favorite memories? What did you want to be when you grew up? 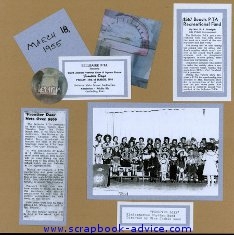 Scrapbook-advice.com Photo Ideas: Do you have any old photos that you collected from your class mates when you were in school? Could they be hidden in a long lost box of treasures from years gone by? 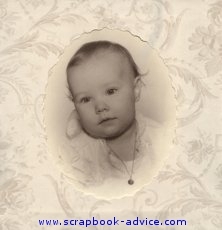 Scrapbook-advice.com Layout ideas: Old school photos with the typical in-style clothes for the time period. Comparison photos of you and your own children - or you and your parents when they were children. Scrapbook-advice.com Journaling ideas: Not many photos, use a lot of journaling to discuss the clothing and hair styles for the time periods and how they have changed - or look better. I had a personal clothing revelation in the layouts below. On a Road Trip last summer, I went back to one of my old homes, just a few doors down from the Elementary School where I first attended school. That trip prompted this scrapbook layout idea for the Book of Me Scrapbook Layouts. As luck would have it, the principal was looking through old scrapbooks and records for the year the school was built, which just happened to be the year I attended first grade. She was kind enough to let me look through things and I found a photo of my class and some newspaper clippings from that year. The layouts above show the items I discovered. In the group photo, I am wearing Cowboy boots, hat, skirt and vest for a Western Show. When I pointed to myself, the principal looked at me a commented that some of my clothes had not changed much! I had just come from a Rodeo and she was right! I had on boots, jeans, western belt and buckle, and western shirt. My hat was in the car! I have removed the two photos on the right side layout which were of the outside and inside of the school for posting on this site to protect children that were in the photos. 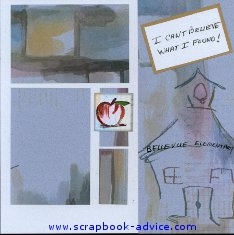 The papers used in these Book of Me Scrapbook Layouts were from the Club Scrap October 2010 kit called Scholarship and the layout design was from their Assembly Line Scrapbook process called ALSB. 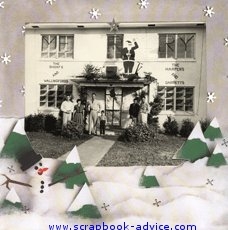 Scrapbook-advice.com Scrapbook Layout Ideas - Any old annuals or school newspapers or possibly your old school has a scrapbook of the period when were in school? I had no idea I would collect anything when I checked with by Elementary school, but found a gold mine. Option #2 - CHILDHOOD COMPANIONS Scrapbook Layout Ideas - Who did you grow up with? Did you have siblings or cousins or others who were like siblings in your life? How did birth order affect your upbringing? Book of Me Scrapbook Layout idea: Do a layout featuring your childhood relationships. How did the relationships start, did you have secret passwords, a code language, a club, other friends in common. Option #3 - WHERE DID YOU GROW UP? - Did you live in the same town or house during your years as a child? Or were you like me, a Military Brat, with no hometown, just a birthplace and lots of temporary houses that you mother made into homes? 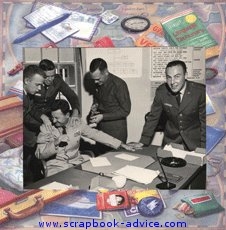 Scrapbook-advice.com Photo Ideas: I tried this once. I sent a letter to the address of where I used to live to ask if I sent a small single use camera, would they take photos of the house, inside and out. My request came back with an email and some digital photos. Here I only had 1 photo - a large 8 x 10 black and white of the house we lived in as one of 4 military families in Tampa, Florida. This photo of the housing unit decorated for Christmas and some of our neighbors standing out front was taken as these were the first place finishers in the decoration contest. Hey, it was December 1953! The background papers had only the green trees so I added some crystal stickers to the tree tops, and cut around them to insert the photo. 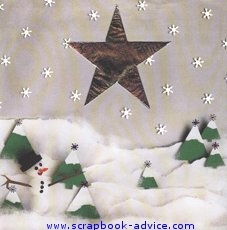 The star on the left was made from cardboard and aluminum foil - by my dad - the same as the one on the top of house! This was a major contribution of my dad's annually, and my memories are of an engineer who got out his drafting compass and slide rule to calculate how to make the star a perfect shape. These Book of Me Layouts actually sparked an entire Family Christmas Traditions Album, with Christmas Foods & Recipes, Family Traditions and journaling about they got started and even photos of the favorite ornaments and where we lived when we collected them. More Book-of-Me Layouts of our preparation for a move to Guam in 1955. Mom and I had to get a passport - we used the same one back then and we all had to get shots back then as well. The photo on the right was from my Dad's office. It was a staged photo, but certainly reminds me of his great sense of humor. Again, while this started out as a Book of Me Scrapbook Layouts, my finished products always seem to start with one idea and sort of finish with another. But, I am in the photos! 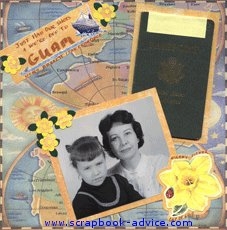 Book of Me Scrapbook Layout Idea: Do a layout that features your memories of your family's home or your hometown. How did growing up in a small town, a city, or various military bases affect you and shape your views today? Photo ideas: The family home or homes you stayed in or something particular about the inside of the homes. Do you have any Book of Me Scrapbook Layouts, or book of me layout ideas that you would like to post with us or share on this website, please Contact Us.